Standard waveforms are sine, square, positive pulse, negative pulse, triangle, ramp up, ramp down. Additionally arbitrary waveforms, multi-level squarewaves, waveform hopping and pseudo-random noise can be generated. Direct digital synthesis (DDS) is a technique for generating waveforms digitally, using a phase accumulator, a look-up table and a DAC. The accuracy and stability of the resulting waveforms is related to that of the crystal master clock. The DDS generator offers not only exceptional accuracy and stability but also high spectral purity, low phase noise and excellent frequency agility. 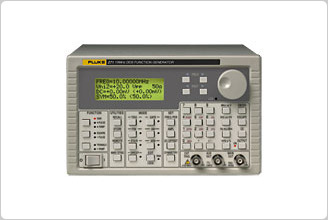 The Fluke 271 generates high quality sine, square and pulse waveforms over the full frequency range of 0.1 mHz to 10 MHz. Triangle waveforms, ramp waveforms and multi-level square waves can also be generated, subject to some limitations in the maximum useable frequencies. Variable symmetry/duty-cycle is available for all waveforms. Arbitrary waveforms can be loaded via the digital interfaces and then used in a similar way to the standard waveforms. Up to five arbitrary waveforms of 1024 10-bit words can be stored in non-volatile memory. The waveform clock is 27.48 MHz maximum. This facility considerably expands the versatility of the 271, making it suitable for the generation of highly complex waveform patterns. In addition, the 271 offers numerous “complex” waveforms pre-defined in ROM. These include commonly used wave shapes such as sine x/x, decaying sinewave, and exponential rise and fall. The signals from the Clock In/Out socket and the Sync Out socket can be used to phase lock two or more generators. This feature can be used to generate multi-phase waveforms or locked waveforms of different frequencies. Sweep. All waveforms can be swept over their full frequency range at a rate variable between 10 milliseconds and 15 minutes. The sweep is fully phase continuous. Sweep can be linear or logarithmic, single or continuous. Single sweeps can be triggered from the front panel, the trigger input, or the digital interfaces. Two sweep markers are provided, which are adjustable while sweep is running. The markers can provide a visual indication of frequency points on an oscilloscope or chart recorder. AM. Amplitude modulation is available for all waveforms and is variable in 1 % steps, up to 100 %. FSK. Frequency shift keying provides phase coherent switching between two selected frequencies at a rate defined by the switching signal source. The rate can be set from dc to 50 kHz internally, or dc to 1 MHz externally. Trigger/Burst. All waveforms are available as a triggered burst, whereby each positive edge of the trigger signal will produce one burst of the carrier, starting and stopping at the phase angle specified by the start-stop phase setting. The number of cycles in the burst can be set between 0.5 and 1023. Gated. The gated mode turns the output signal on when the gating signal is high and off when it is low. Both triggered and gated modes can be operated from the internal trigger generator (0.005 Hz to 50 kHz) or from an external source (dc to 1 MHz). Waveform hop. The generator can be set up to ‘hop’ between a number of different waveform setups, either at a pre-determined rate or in response to a manual or bus trigger. Up to 16 different hop waveforms can be defined in terms of frequency, amplitude, function, offset and duration, which is variable in 1 ms steps up to 60 seconds. Noise generation. The Fluke 271 can be set to simulate wide band random noise with adjustable amplitude and offset. All waveforms are available up to 10 MHz. However, the purity of triangle, ramp, and multi-level square wave waveforms is not specified above the frequencies indicated in the following section. Up to 16 steps available per cycle, each step selectable for amplitude (10 bit resolution) and duration (1 to 1024 samples). Above 27 kHz a 36 ns edge uncertainty is introduced. A number of “complex” waveforms are pre-programmed in ROM . A further five, user defined, waveforms may be loaded via the digital interfaces and stored in non-volatile RAM. Frequency range: All waveform points can be continuously output up to 27 kHz, beyond which they are sampled. Noise: Wideband noise with variable amplitude and offset. (open circuit value) or V (Voltage into the characteristic impedance) in pk-pk, RMS or dBm. Note that in positive or negative pulse modes the amplitude range is 2.5 mV to 10 V pk-pk O/C. Non phase-coherent signal keying — output is On while Gate signal is high and Off while low. Sweep width: 0.1 mHz to 10 MHz. Phase continuous. Independent setting of the start and stop frequency. Up to 16 different “hop” waveforms can be defined in terms of function, frequency, amplitude, offset and duration. Duration setable per step 1 ms to 60 s.
Trigger Generator Internal source 0.005 Hz to 50 kHz squarewave adjustable in 20 us steps. 3 digit resolution. Available for external use from TRIG/SWEEP OUT socket. Trig/Sweep Out Multi-function output depending upon mode. Except in sweep mode, the output is that of the trigger generator at CMOS/TTL levels from 1 kW. In Sweep mode the output is a 3-level waveform, changing from high (+4 V) to low (0 V) at the start of sweep, with narrow 1 V pulses at each marker point. Sync out TTL/CMOS logic levels from typically 50 Ω. The signals from these sockets are used to phase lock two or more generators. RS-232 Variable Baud rate, 9600 Baud maximum. 9-pin D-connector. Data entry Keyboard selection of mode, waveform etc. ; value entry direct by numeric keys or by rotary control. Stored settings Up to 9 complete instrument set-ups may be stored and recalled from battery-backed memory. Power 100 V ac, 110 to 120 V ac or 220 to 240 V ac +/– 10 %, 50/60 Hz ac by internal adjustment; 30 VA max.